I've got a couple of Soho Garden layouts to share that debuted on the American Crafts blog yesterday! Journaling says: It's Jane's actual baby blessing which is too sacred to share with the world. I printed it really tiny and adhered it to one of the frames so Jane can read it whenever she wants when she's older and going through a hard time and needs to be uplifted and know how much we love her. Note: I had a really hard time scrapping these photos for some reason! Bad mojo day I guess. I actually made a completely different layout, hated it, tore off the pictures, and started over. Even this layout took forever and a day to make. Sometimes that just happens. How to: Die cut frames from patterned papers and adhere them over pictures then onto a pink ledger paper background; use pop dots under some of the photos. Adhere additional frames in the empty spaces and trim any excess. 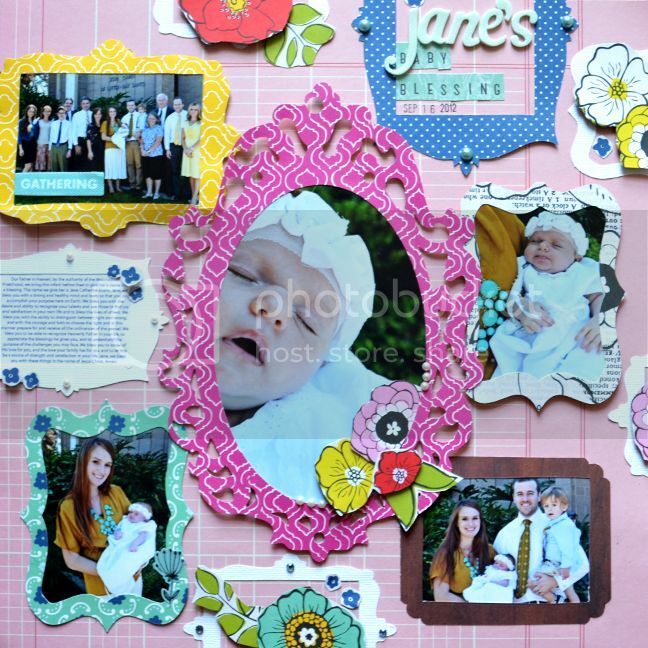 Print out journaling and add it to one of the frames. Create a title in an empty frame and stamp the date of the event below. 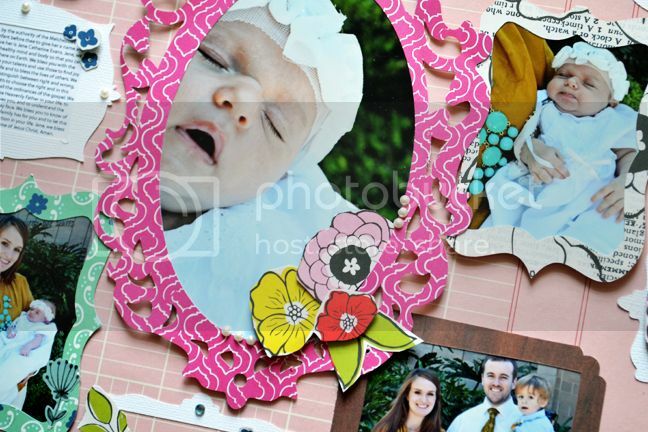 Cut out flowers from patterned paper and add them to the remaining empty frames and on the large central photo. Add a few pearls to some of the frames. Journaling says: Oops. There ain't no journaling... a picture's worth a thousand words?? If I were to add journaling it would say: These shoes were a bit too big for Fox's feet so we had him wear some stripe-y socks. You know the difference between us? He makes those look good! How to: Trim off the tearaway strips from all the Soho Garden papers as well as 1/4" strips from all the patterned papers. Trim the strips into 2" pieces and angle the ends. 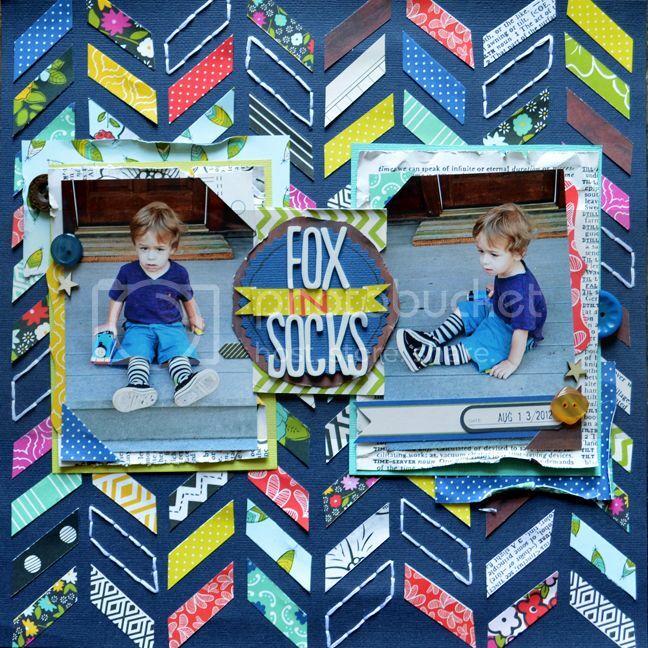 Adhere the paper pieces in a chevron design across a dark blue cardstock background. Trace around a few of the paper pieces, remove them, and stitch over the tracing with white thread. 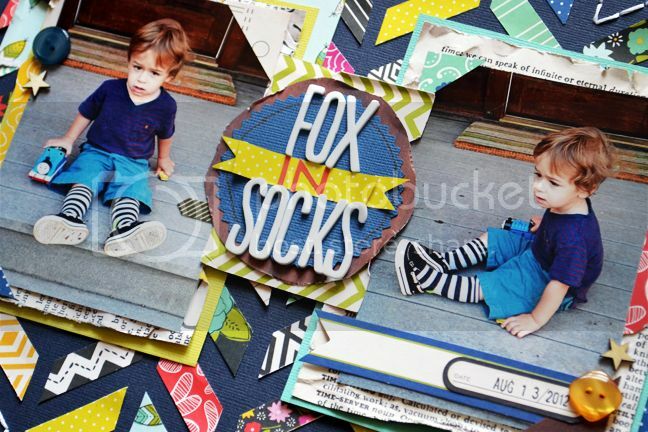 Create photo mats, embellish with buttons, the date of the pictures stamped on a label, buttons, wooden veneer stars, etc. Create a title in the middle using letter stickers. That's all I got for now! These are gorgeous!! LOVING the frames on the first one and love love love the chevrons on the second one!! And that title on the second one is AWESOME-SAUCE!!!!!!! soooo sooo cute!!! LOVE LOVE the frames and then the chevrons!!!!!! sooo much fun on your pages!!! SO inspiring today Paige--really like them BOTH! love all the frames and adore Fox in Sox! Super fun! LOOOOVE those frames and I LOVE the colors for Fox's page! LOOOOOOOVE! Paige, you are so talented!!! I love all the frames and the chevrons! Such and adorable baby and fox is sooooo cute!!!! I totally adore that fox in sox layout, Paige! ^_^ Happy travels!! The One with iPad Apps? The One with Where in the World?